Anyone for tennis? There is a lot to think about in life and getting organised for future events is often hard to do. I'm going to try and help you focus on one of them. Tennis is a sport which has dominated my family life and my father in particular was a real fanatic, playing at least four times a week right up to the age of 80 and my brother aged 70 was boasting only last week of winning his latest match in Cape Town S.A. where he now lives. My experience is that it is a game which all the family can enjoy and it doesn't really matter what your level is. Which I think is one of the reasons our collection of holiday properties with private pools and private tennis courts attracts so many clients, with many returning year after year. Some of you have already booked for next year, others are either unable to commit just yet or are hesitating, yet to decide where to go next summer. To help you get on and book for next year we are able to offer a low deposit option of just 10%. 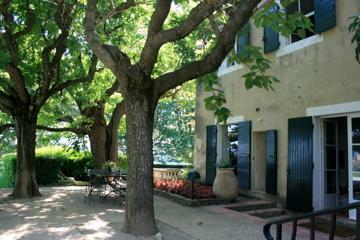 The villa La Chatronnie VID24 is a perfect example of a gite with tennis, located in the beautiful Dordogne region of France it sleeps up to 15 people and costs from 998€ (yes that's all!) to 2950€ per week. 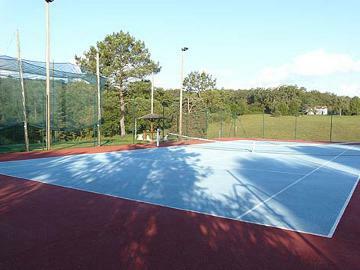 As well as an indoor, heated pool, nine bicycles, snooker table and a golf driving practice range it has a superb floodlit tennis court.
" The villa was beyond our wildest expectations. Marvellous. It exceeds anything we have experienced with our children and grandchildren in the past 10 years. The owners were very kind and helpful and they surprised us with strawberries. The tennis court was highly appreciated by my grandsons to upgrade their skills. They were successful because their teams became champion! (11 and 13 years old.) 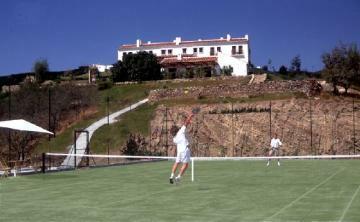 "
Call us now on freephone +33 800 800 565 to discuss the requirements for your holiday home with private tennis court. We are familiar with the properties and can quickly get answers to any of your questions. If you prefer send an email and let us know what your criteria are, we will respond within 24 hours.